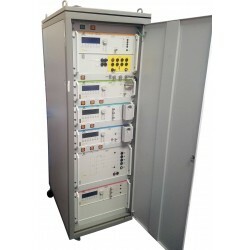 The EM TEST transient generators are the ideal starting point to set up an EMC test facility. Most versatile to meet many requirements but also most ecomomic in terms of cost they are designed for fully compliant conducted immunity testing. 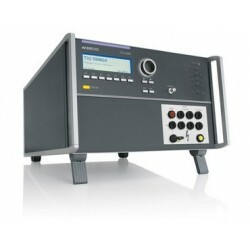 The following "all-in-one" solutions are available to meet your test requirements. 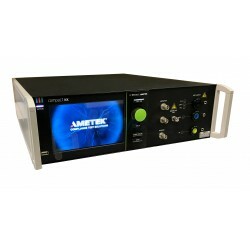 The EMC Shop stocks an assortment of the EM Test transient generators and with online ordering it makes everything fast and easy. 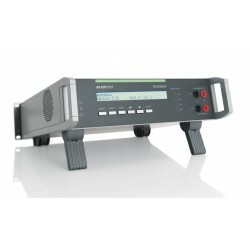 Surge: Generators for combination/wave test IEC 61000-4-5, ANSI C63 and more. 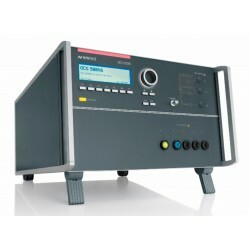 EFT/Burst: Electrical Fast Transient Generators for IEC 61000-4-4. Dips, Drops (& Variations): PQF/Powerline Tests in accordance to IEC 61000-4-11, 4-29 and more. 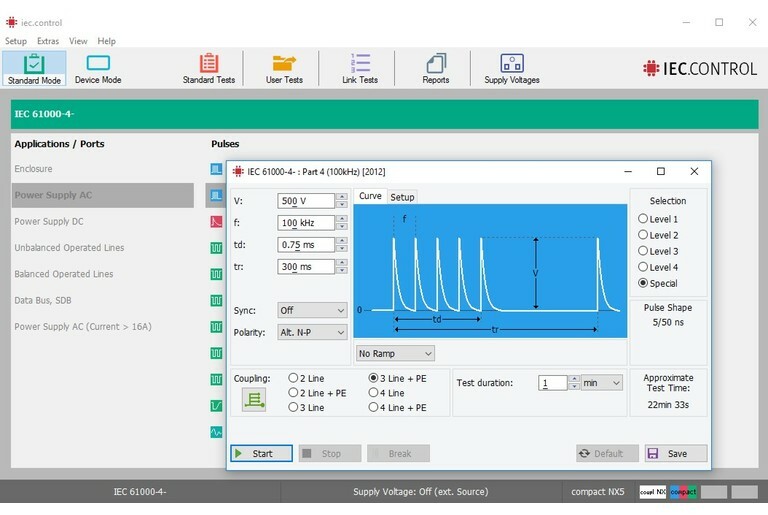 Automotive: Assortment of transient surges found in DC powered vehicles..
Ring Wave: Oscillatory wave tests per IEC 61000-4-12, 4-18, ANSI and more. Telecom: Additional tests on data lines in unison with surge simulation tests. Flicker & Harmonics: Power sources and analyzer turn key systems per IEC 61000-3-2 and 3-3. IEC.Control allows for remote operation, custom test sequences, an expansive test standards library and reporting. 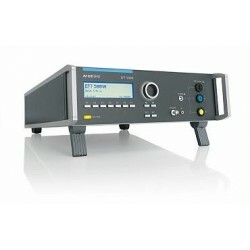 EM Test Transient Generators There are 41 products. 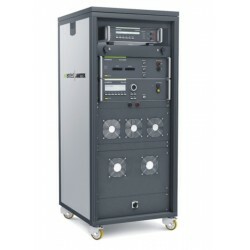 The EM TEST modular multifunctional test generators are the ideal starting point to set up an EMC test facility. Most versatile to meet many requirements but also most ecomomic in terms of cost they are designed for fully compliant conducted immunity testing. 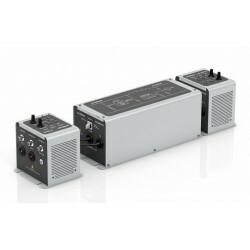 The EMC Shop stocks a variety of configurations to help you meet your testing needs, now. Surge pulses occur due to direct or indirect lightning strokes to an external (outdoor) circuit. This leads to currents or electromagnetic fields causing high voltage or current transients. Another source for surge pulses are switching transients originating from switching disturbances and systems faults. Due to the characteristic of the phenomenon nearly every electrical and electronical device may suffer from such lightning events which justifies the necessity of surge tests being widely performed. Surge voltage can reach several thousands of volts and surge current is seen to reach several thousands of amps. 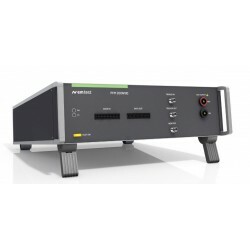 EM TEST offers high-end EFT/burst generators with maximum pulse amplitude and spike frequency capabilities, best user convenience and built-in coupling/decoupling networks, strictly conforming with the latest requirements of EN/IEC 61000-4-4. Apart from standalone EFT/burst generators multi-functional generators with additional testing capabilities (e.g. 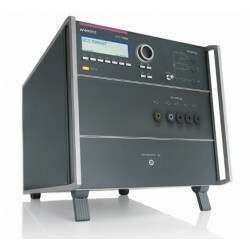 Surge, PowerFail and Ringwave) are available as compact solutions. Voltage dips, short interruptions and variations of voltage and frequency in supply systems can considerably affect electrical and electronic systems. 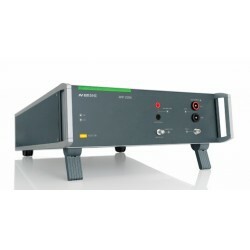 EM TEST supplies fully compliant power quality test solutions for to simulate the various supply voltage anomalies. Testing with current surge pulses is common for testing components such as surge protection devices. 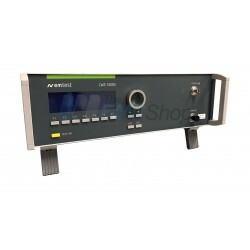 For this purpose current pulses with various waveforms and amplitudes from several tenth of amps up to several thousand amps are required. EM TEST offers solutions to fit these requirements.